Thank you to Senators Folmer and Williams for convening this very important committee hearing. My name is Carl Romanelli. I serve the Green Party in various capacities from the local level to the international. I am a past chairperson of the Pennsylvania Green Party, a former Green Party candidate for US Senate and I’ve been a litigant, both personally and in my role as a party chair; in cases against the Commonwealth regarding the treatment of third party candidates in Pennsylvania. The Pennsylvania Green Party fully endorses SB 495 and encourages support of it from this committee and this chamber. In a recent Federal District Court decision, Judge Lawrence Stengel found that Pennsylvania’s practice of requiring a disproportionately larger number of voter signatures, in combination with the state’s challenge system; is unconstitutional, further showing the need for new legislation regarding access to the Pennsylvania ballot. It is also rational to assume that the protections guaranteed to Americans under the US Constitution and those defined in the Pennsylvania Constitution would also inspire movement in support of the proposed Voter Choice Act. During the past decade we have witnessed Pennsylvania earn the dubious distinction of being the most difficult state in the US to obtain ballot access outside of the Democratic and Republican parties. This de-evolution occurred without any legislative initiative of formal change in the law. Rather it occurred due to blatant assistance of all three levels of Pennsylvania government. Governor Wolf has chosen to appeal the aforementioned federal court case concerning the treatment of third parties. The court decision provided the Executive branch with an opportunity to set administrative guidelines in response, yet it failed to do so. Opposition to reform of ballot access from Governor Wolf should be no surprise, since as a candidate Mr. Wolf made clear he opposed any change third party and independent access in Pennsylvania. As a matter of fact, the only Democratic gubernatorial candidate in a crowded field to voice any concern on this issue was John Hanger. In the General Assembly we were exposed to flagrant partisan behavior that even crossed the line of legality. It was learned through the Grand Jury Presentment of July, 2008 that the challenges against my candidacy in 2006, and in Ralph Nader’s of 2004, that these challenges were prepared using employees of the Pennsylvania House Democratic Caucus; on state time receiving state paychecks, in state offices, using state resources and participating employees being given tax payer funded “merit” bonuses. Despite convictions and guilty pleas to charges of conflict, theft and conspiracy; to date not so much as a symbolic resolution has been passed in the General Assembly apologizing and promising to never again do this to the citizens of our Commonwealth. Passage of 495 would be a powerful gesture toward reversing the shame the bonus gate scandal has cast upon the General Assembly. To me, the most disturbing failure is that of the judiciary. Through its allowance of frivolous challenges and aiding every request of the old party challengers, the courts have perverted the very spirit of the law concerning challenges. The standard of challenging nomination papers is designed to place the burden on challengers to demonstrate, specifically, where a paper is flawed, and why it is flawed. At impasse, the benefit of the doubt was always to be in favor of the signer’s right to speech and to insure there is no inadvertent disenfranchising of Pennsylvania citizens. Since 2004 such standards and protections have been swept away. Nowadays, the signer of a nomination paper is held to a significantly higher standard than are challengers and their attorneys. Such practice has resulted in an official oppression of any targeted independent or third party candidate by the very institutions that are supposed to protect us. Even when compelling and extraordinary evidence is brought before state courts, citizens are not heard, but partisan interests are carried out to every detail. This is certainly not the impartial judiciary we Americans have come to expect. My own journey into Green politics is a unique story and its origin goes way back into my own history. Since I was a child I had always dreamed of one day being a senator. Never did I hold aspirations to be a president or a governor, but rather a legislator. Through such deliberation one can truly affect policy and be a voice for change, when such change may be warranted. Like many of our childhood dreams, I too felt mine had to take a back seat to my responsibilities as a spouse, father and student. Having to work full time and support a family is one’s first responsibility, so many dreams are moved aside. However, I was fortunate enough to be in a position to revisit such ideals when my sons were grown. Further, outrage at what I saw as unacceptable intervention on the part of the US Supreme Court in the Bush v. Gore matter inspired even more motivation. 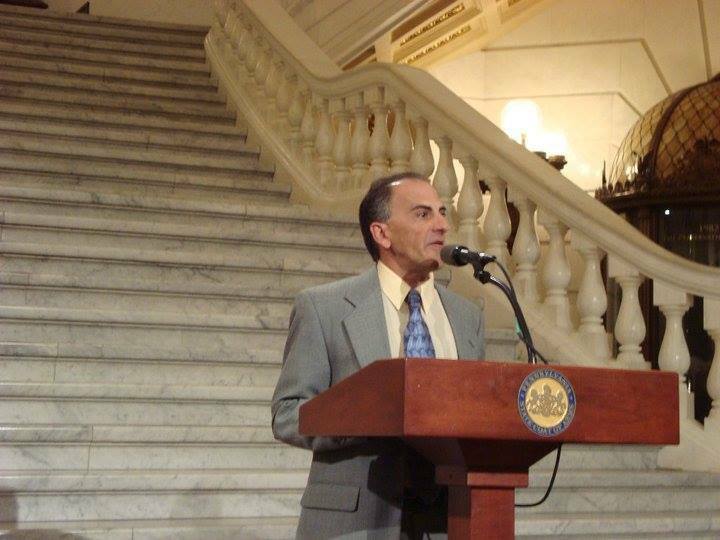 In early 2001 I retired from my very comfortable position with the Luzerne County Court in order to help build an alternative to the Republican and Democratic Parties. This was done not with the expectation of winning a US Senate seat, but rather running for the seat. Such a candidacy, I reasoned, would allow for discourse on the issues of our time from a perspective missing in the current politic of the day. 2006 was an historic year in third party signature requirement. While Democrats and Republicans needed the standard 2,000 voter signatures to be ballot qualified, my requirement was 67,070. Proudly, I was able to file a package of nomination papers containing the signatures of 94,544 voters. It was an amount larger than the filing of any candidate, from any party, in the history of Pennsylvania elections. Also, the filing was carefully reviewed to assure any visibly invalid signatures had been crossed off, or not even submitted. As a retired officer of the court it was important to me that our package hold the utmost of integrity, and I took my responsibility to file in proper conformity to the requirements of the commonwealth, despite my opinions of the fairness of such a difficult standard. What followed can only be described as pure torture. Upon having more than 70,000 of our signatures challenged, the Greens were required to have 9 volunteers in Harrisburg, from 9am to 4pm, Monday through Friday for about 6 weeks to review all of these challenged signatures. In October of 2006 I was removed from the ballot, and for the pleasure of such abuse the court imposed more than $80,000.00 in legal fees and costs against me. Needless to say, the experience left me outraged and traumatized. In subsequent years we have seen various third party and independent candidates withdraw from the ballot, rather than face the threat of life ruining fees being assessed on them. We have seen many retreat from the very notion of being a candidate due to such threats. The bill under consideration here has been around for at least three previous sessions of the General Assembly, yet today’s hearing is the first ever held. This body has an opportunity to do something great for Pennsylvania, and for what it means to be a Senator and an American. However, understand that my hope for such reform is not very high. Past behavior and practices seems to indicate this body has no concerns for values contained in this testimony. There seems to be even less resolve for action. Yet, I do understand that this is a wonderful opportunity for the Pennsylvania Senate to do something amazing, because it is the right thing to do, rather than because of a material or strategic gain. I challenge you all to dare to do great things, because as Senators you can really do so. I challenge you to follow the lead set by Senator Mike Folmer and be senators, not politicians. Thank you all for allowing me this brief, yet important, opportunity.